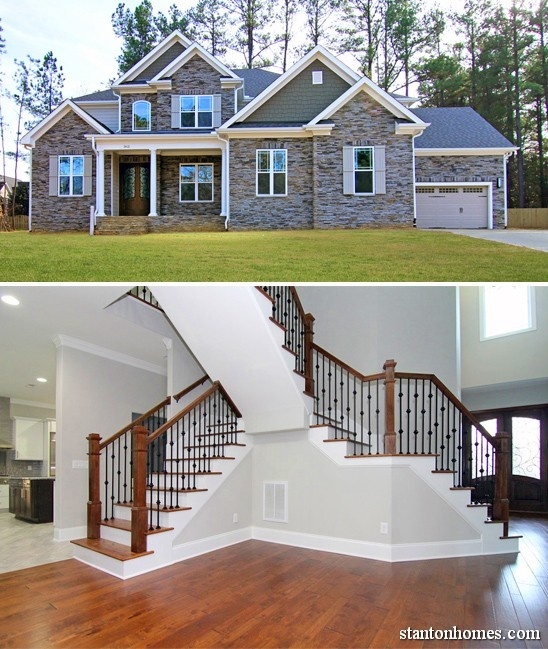 Raleigh luxury homes offer features like kitchens with multiple islands, huge master suites with spa bathrooms and room-sized closets, separate entertainment floors with full bar and fireplace, window walls, and rooms for everything - including your pets. 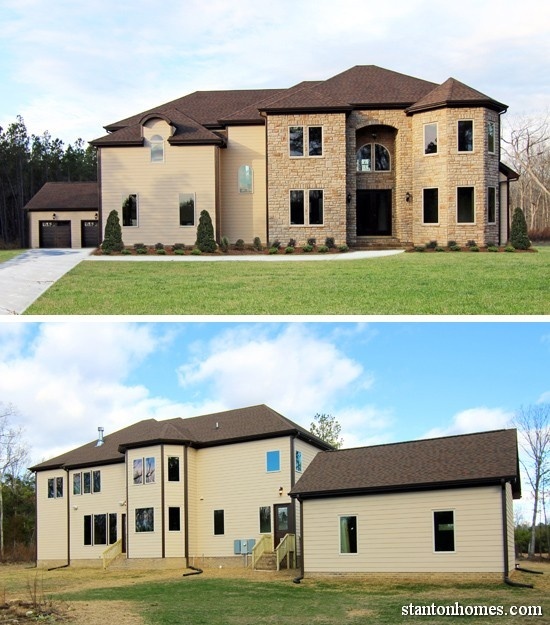 See photos of Estate New Homes in the Raleigh, NC area - built by Stanton Homes. 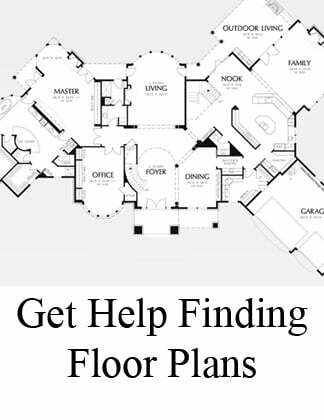 Although estate homes are typically larger with 3+ car garages, multi-island kitchens, dual master suites, and basement apartments, they also feature a lot of cool finishes, layouts, and selections not found in average price points. Take a look inside these luxury homes - and ask us which new home details come STANDARD in a Stanton Home (like built-in energy savings and innovative construction technologies). This Estate new home opens into a movie set stairway with incredible curved overlook above the kitchen and two story great room. The basement is an entire entertainment floor, with full bar and fireplace. The floor plan has rooms for everything, including the dog and the cat. See inside - click here for the photo gallery. This version of the Avonstone Manor has a gourmet chef kitchen with two islands; home bar with wine fridge, ice maker, glass front cabinets, and built-in sink. Luxurious master suite with sitting area. Massive vaulted master bath with "island" soaking tub and shower sauna. Two story great room with European fireplace. Grand curved staircase. Private bathroom in every bedroom. Media room, bonus room, and video room. Two laundry rooms, one on each level. Formal dining room. Home gym / exercise room. See it all, inside the photo tour - click here. 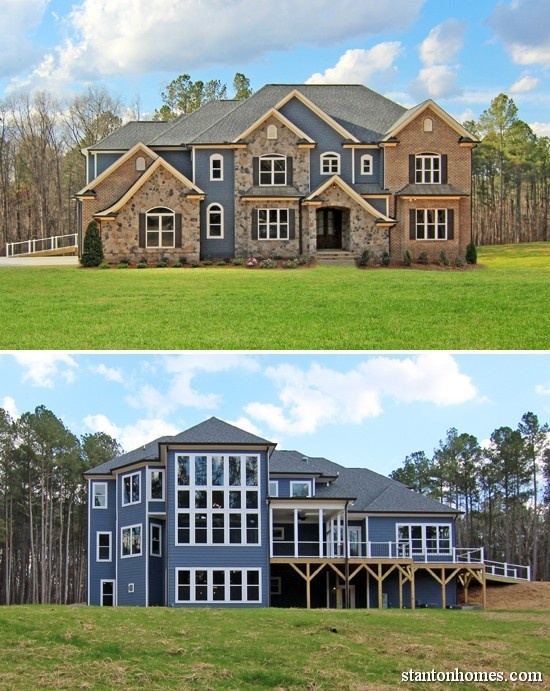 This Raleigh version includes a downstairs Multi-Gen suite (with private laundry room and sitting room library), huge island kitchen, separate mud room and dog room, home gym / exercise room, home theater, office, and formal dining. Get more photos in the tour - here. 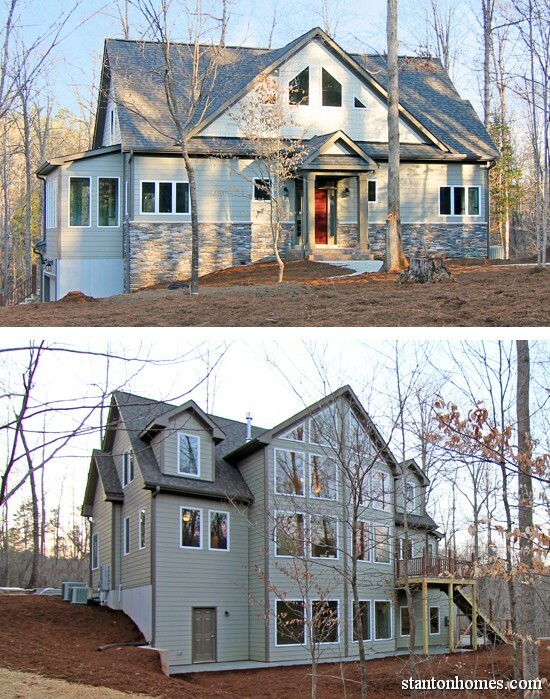 This craftsman style contemporary custom home plan has open concept living. The oversized island kitchen opens to a vaulted keeping and breakfast room. Stone fireplaces warm the keeping room and private master suite sun room. And an angled side entry garage leads directly into the mud room style laundry room. Dual drop zones provide storage. See all estate home photos, here. 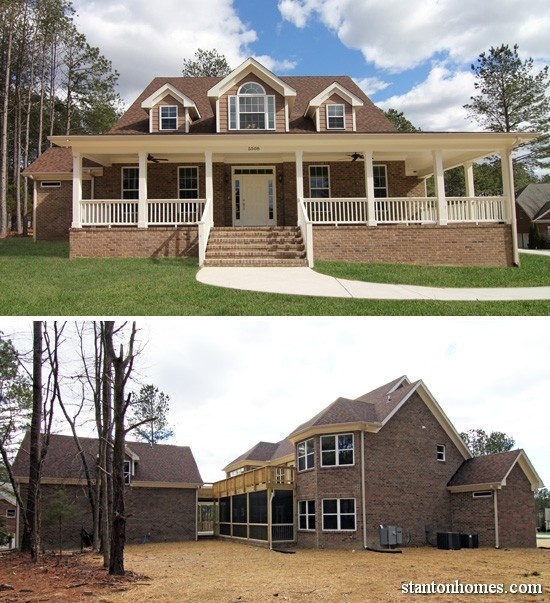 The farmhouse exterior includes three separate outdoor living spaces: wrap around front porch, backyard screened patio with see-through fireplace, and second story deck (the 3 car garage is detached, connected by a breezway). The master suite is downstairs and includes a walk-through, two entry shower. 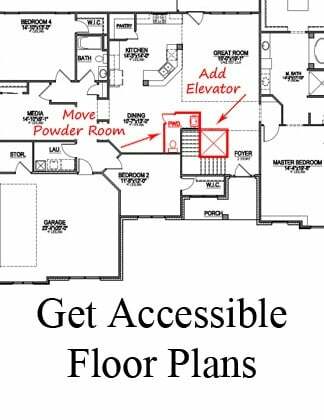 Upstairs is for work and play with a pocket office desk and built in home theater. 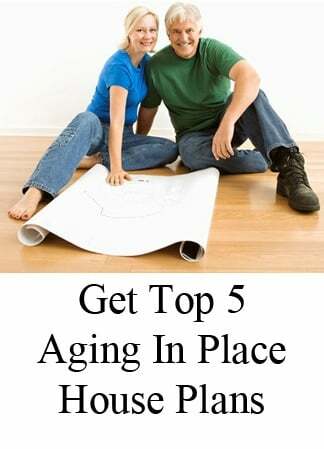 See interior photos of this luxury home - click here. 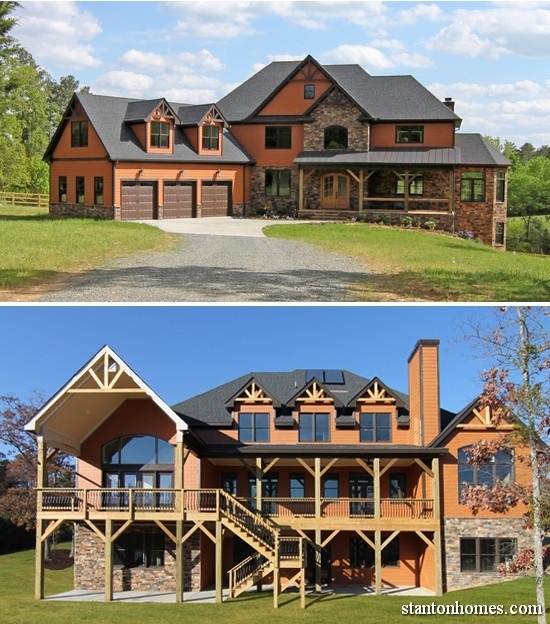 This "mountain style" home includes an open layout with large kitchen, two story great room with entire wall of windows, second story loft with overlook, sun room with built in storage benches, and a North Carolina style walk-out basement with game room. See the photo gallery of this mountain home, here. The beautiful double glass front doors open through an archway - giving you first glimpses into the open great room, wheelchair accessible kitchen, and luxury one story living. 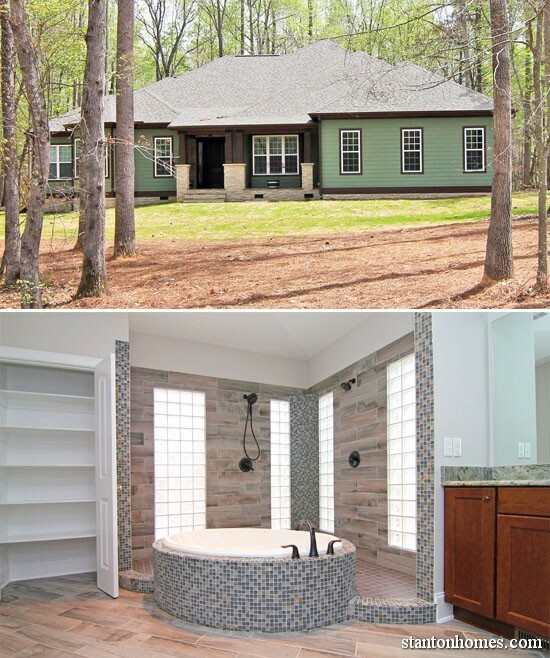 Click to see a photo gallery inside this home: two-person shower in the master suite, luxury kitchen features, fully wheelchair accessible floor plan. 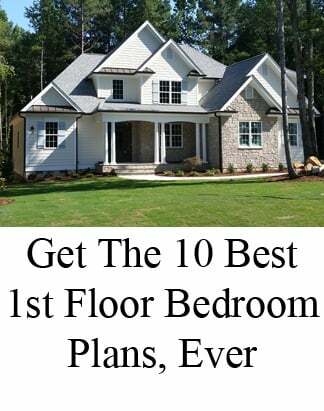 While the Coquery Cottage does not have a typical "estate" exterior, the sweeping one story layout and kitchen and master suite designs give it a leg-up on the competition. See the photo gallery, here, with features like an interior stone archway, curved tile tub INSIDE the open shower, and two island kitchen. This version of The Serengeti offers two master bedrooms (one upstairs, one down) in a multigenerational floor plan. The two islands in the kitchen open to the breakfast, sitting, and keeping room. A home office, in addition to the five bedrooms and formal dining, offers flexible home space. 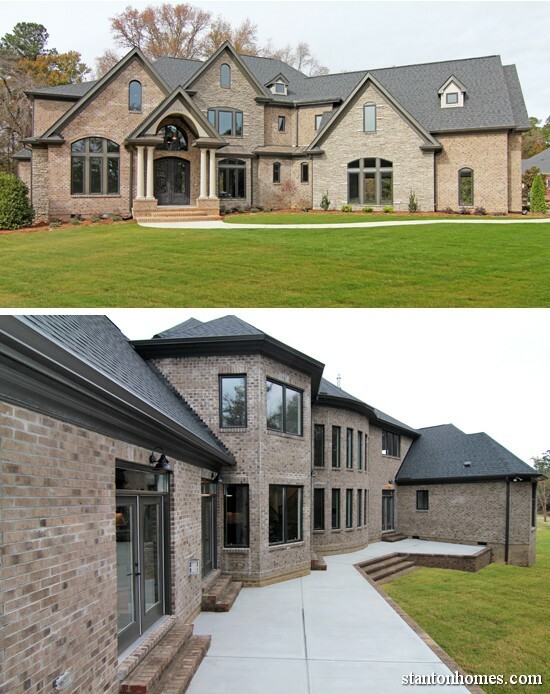 See inside this estate new home, here. 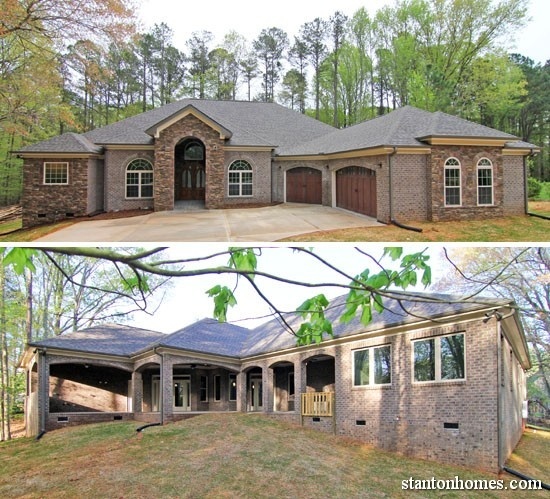 Here are more photo gallery ideas for your Raleigh luxury home plan - contact Stanton Homes for more information on pricing, floor plan ideas, and the custom home building process.